Palm Desert has much to offer outdoor enthusiasts, with our Hopalong Cassidy, Randall Henderson, and Herb Jeffries hiking trails. The Santa Rosa San Jacinto Mountains National Monument is also accessible via various trails and offers yet another option for hikers looking to explore. 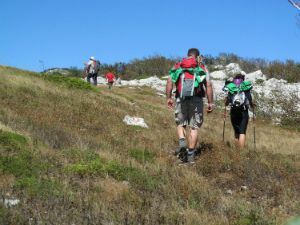 Hiking is a fantastic way of exercising, as it enables you to get in a cardio workout while appreciating the natural beauty, but it does increase the risk of having blisters form on your feet. Blisters can be annoying, give you discomfort or pain, and provide a serious threat if you live with diabetes. The good news is that they are generally easy to treat and most will actually heal on their own if you give them the time to do so. If you are faced with a large, painful blister, though, it might be best to drain it yourself. As long as you do not suffer from diabetes, you can drain the fluid contained within a blister with a sterilized needle. Start by washing the area with soap and water. Wipe your needle with rubbing alcohol or iodine to sterilize it and then puncture the blister near the edge. The fluid will either drain on its own, or you may need to press down gently and force it out of the hole. After it has been drained, wash the area, smooth the flap down over the tender skin, and apply antibiotic ointment and a clean bandage. Blisters can be particularly painful or uncomfortable when you are exercising, especially if hiking and running are part of your workout routine. Should this be the case, try replacing those activities with either bicycling or swimming to avoid further pain or discomfort. Once your blister has gone away, you can resume your normal workout program. These fluid-filled sacs can be a delicate matter if you have diabetes. If a blister were to burst, it could ultimately lead to a dangerous infection. Contact us for treatment rather than trying to take care of it on your own. If you live in the Palm Desert, CA, area and are in need of exceptional foot and ankle care, contact Harvey R. Danciger, DPM, today by calling (760) 568-0108 or requesting an appointment on our website.